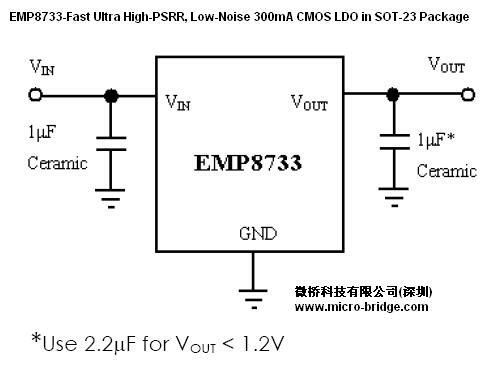 The EMP8733 features ultra-high power supply rejection ratio, low output voltage noise, low dropout voltage, low quiescent current and fast transient response. It guarantees delivery of 300mA output current and supports preset output voltages ranging from 0.8V to 4.5V with 0.05V increment. Based on its low quiescent current consumption, the EMP8733 is ideal for battery-powered applications. The high power supply rejection ratio of the EMP8733 holds well for low input voltages typically encountered in battery operated systems. The regulator is stable with small ceramic capacitive loads (1μF typical). The EMP8733 is Available in miniature 3-pin SOT-23-3 package. EMP products are Halogen free and RoHS compliant.